I read somewhere recently (where? when I Google it now there is an unsurprisingly large number of hits) that our current collective unhappiness is simply (“simply”) the result of our inability to believe in the future. That dis-ease is right, right? When was the last time you could comfortably toss your thoughts beyond the upcoming decade? (A responsible, gainfully employed friend, when asked if she had started a retirement account, laughed a huge laugh until sludge came dripping out of her mouth.) So, yes, future plans have melted into bitter tar. But the symptom’s misnamed. all over the gray beach like boils. death was. It was all wet and hard and it never dried. were eating themselves. . . The most definitive thing I can say about that blank, the whatever-is-blanker-than- unhappiness, is that I trust the blank. The ineffable is not so easily trifled with. But you have to try. Countryman does it by singing, laughingly/knowingly/lightly, in her debut collection. 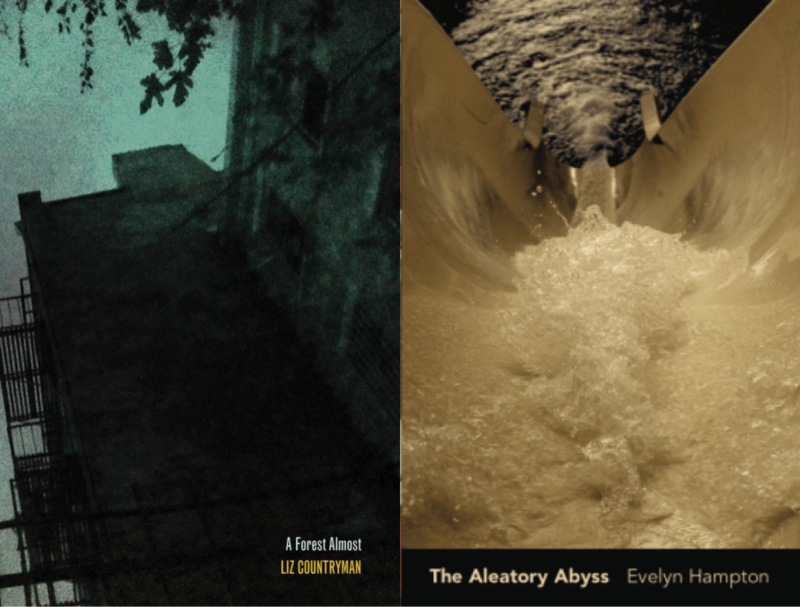 And Evelyn Hampton does it, in her long essay The Aleatory Abyss, by screaming, silently, so that no passerby can detect her acute breakdown. Reading these books during a dark December twinned them in my mind. It may not be fair to either, but I want to talk about them together. First, Hampton’s patient, platitude-less meditation. It takes place in Oregon, where she is living on the outskirts of a mall and working at a community college, and its topics are trash, squatting, and homelessness in many senses of that word. It’s a quiet book… the kind of quiet a spider emanates when it senses a large object moving toward it with a blunt instrument. An image of Edvard Munch’s The Scream seems to overlay Hampton’s paragraphs, and Chapter 6 begins with a list, delivered flatly, that points to Munch: “Hobbies: Making slow progress toward figures in dreams. Driving. Pantomiming an ongoing scream.” There’s a sense of disassociation here that the word pantomime invokes: gestures mimic or approach emotions, but a flat, protective numbness prevails, like when Hampton describes a red sunset (one that matches the sky in The Scream): “It looks like bad dye, something that if you eat it will give you tumors. But to look at, it’s lovely.” It’s like, yes, a lot of what we ingest is colored with carcinogens, but hey, modern life is nothing if not a damaging collection of expertise and knowledge that we ignore in order to survive. Exiting the mall I immediately enter the parking lot. Home, a low complex of apartments, lies across a distance I have trouble gauging with any part of my body because parking lots are not built on the scale of bodies but of machines with internal combustion engines . . . I am both passing through a place where I would never live, and living in the place where I would never live. It is one holy thing that has blown apart into fragments. Pieces of lost speech, bygone language. I think of Avelokitsvara, the deity who, upon hearing the cries of sentient beings, burst into thousands of pieces, then wandered the earth collecting them. What on first read I would have described as (“simply”!) numbness in Hampton’s essay is actually, I think, a yearning to feel as deeply as the situation warrants, and not to be destroyed by that feeling. Countryman’s collection, too, is marked by a passing throughness, a failure to feel: The opening poem includes these lines: “We went through the woods but they passed by us / like a cheap haunted ride.” Overall, numbness is a pretty lovely state (“to look at it’s lovely”) in A Forest Almost. Like watching a horror movie with the Pines of Rome dubbed over it. She nails the impenetrable sensation of distance: “yes — / so we were figures / held apart by dapples, // there was stillness of a Saturday, / the trees browsed each other.” I love that verb “browsed” there: the casualness of looking, life as a series of fine distractions that empty us. Or a serious of fine distractions that help us survive it? met them the way I wanted. When I say I want you, this is what I mean. When she says she never walked into them, I’m not sure whether she means the greens or the cars. Probably the greens, as that’s the last noun mentioned. but also this book keeps undermining my sense of okayness with its awful pronouncements. It keeps teaching me to stop trying to think safely. So I’m going to interpret that line as “cars”: she never walked into the cars from the highway the way she wanted. In Ohio, calcium chloride — road salt — cuts the soles of his feet . . . He keeps walking. He makes records of garbage, old signs with most of the letters missing, stuff nobody else sees. I think of all the garbage between us, the discards lying between our bodies. It’s absurd for me to write anything after that paragraph. But I guess that’s the point of these books? Just keep going, as if nothing just happened. Or as if safety or something else nice, were a certainty. just to get you to come. Or is only getting older. Again, probably not right to review these two books together, but they both put their fingernails into the same part of my brain. And then, this is too neat, but: The authors’ last names are both places. Hampton’s of course is home, and Countryman’s is a wide-open land. Absolutely wrong for each of their books, but it’s lovely (in that numb, browsy sort of way) that each contains place names, because these books are really the land where we live now. The Land of Numb. State of Pale Facsimile. Facade Address. Passing through to…nowhere really, because if we’re honest (don’t be!) (or as Countryman writes, “Please give me your blessing, thing I live by ignoring”) the future is very blank. But I do, while I’m here, want to be able to hold all the garbage. I want to be able to hold all the garbage. Darcie Dennigan writes poems and plays. Her fourth book, The Parking Lot and other feral scenarios, is out from Forklift Ohio in September 2018.